A deferred report is a Managed Reporting report that you can run as a background task, while continuing other work. In HTML Composer, you may add a hyperlink to a run a report deferred, or create a control that adds a Defer button. Note: The deferred option is only available in HTML Composer from the Managed Reporting environment. Controls appear when you reference a report or graph with parameters. HTML Composer automatically adds a control, Run button, Run Defer button, Reset button, and Schedule button for the parameters in your layout. Note: A schedule button only appears if your WebFOCUS environment is licensed to use ReportCaster. For more information about the schedule button, see Adding ReportCaster Schedule Capability to HTML Composer. 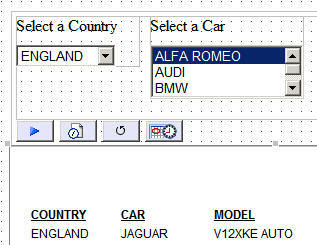 You may use the Form Settings dialog box to set when the Defer button appears with the controls. The Defer button is selected by default. Select Options from the Window menu. Click the Form Settings button. The Form settings dialog box opens. 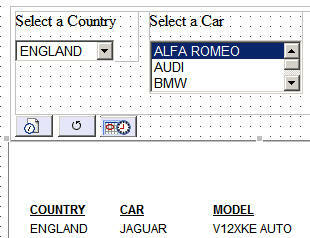 Deselect the Add defer button. Note: If you deselect this option, you have the ability to add a hyperlink button to run a report deferred. 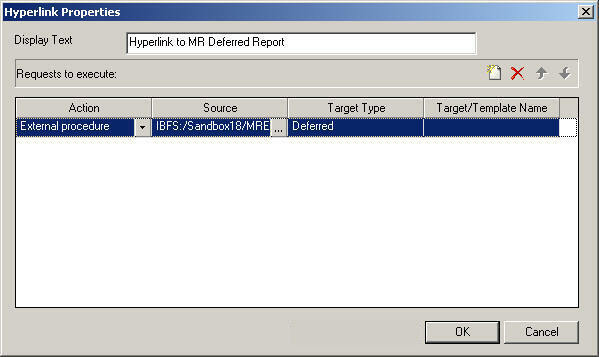 For more information, see How to Add a Hyperlink to Run a Managed Reporting Report Deferred. A defer button enables you to execute the selected report in deferred mode. When referencing an existing procedure with parameters in HTML Composer, the defer button is automatically added. Only procedures referenced in HTML Composer are able to be deferred. Access the Standard Reports folder of your Managed Reporting environment to begin this procedure. Drag the crosshair to create a report (or graph) object and adjust it to the size you want. Right-click the object and select Reference existing procedure from the context menu. Select an existing report or graph with parameters and click Open. Click OK to add the new parameters and the controls to the HTML page. The Run, Run Defer, Reset, and Schedule buttons appear with the parameters on the HTML page. Execute the request and click the Run Defer button. The Deferred Report Notification is generated, as shown in the image below. When referencing a Run Only Deferred procedure, HTML Composer automatically adds a control, Run Defer button, Reset button, and Schedule button for the parameters in your layout. The Managed Reporting deferred external procedure was created with the Only Run as Deferred Report option in the Managed Reporting environment. Note: Access the Standard Reports folder of your Managed Reporting environment to begin this procedure. Select an existing Run Only Deferred report or graph with parameters and click Open. The Run Defer, Reset, and Schedule buttons appear with the parameters on the HTML page. The Run button is not applicable when adding a Run Only Deferred report. You may add a hyperlink to run a Managed Reporting report deferred. This is useful if you are referencing a report or graph without parameters. Drag the crosshair to create a hyperlink object and adjust it to the size you want. Enter the text you want to display as the hyperlink in the Display Text field. Select External procedure and enter the procedure name in the Source field, or click the browse (...) button to browse to the procedure. Select Deferred as the Target Type. When a deferred external procedure is selected as the Source, Target Type automatically defaults to Deferred. The Target/Template Name field is not applicable when the Target Type is Deferred. The following image is an example of the Hyperlink Properties dialog box with the deferred option selected. Execute the request and click the hyperlink to run the deferred report.